“Pulp Fiction” was the movie that defined the 1990s and independent film culture for two generations. Quentin Tarantino’s smooth talking philosopher hitmen, Jules Winnfield and Vincent Vega, defined cool in an awkward Tarantino kind of way. One of the most memorable moments in “Pulp Fiction” comes when Vincent accidentally shoots a just rescued Marvin in the face, forcing Jules to find temporary safe haven in Toluca Lake garage of his friend Jimmie. But Jimmie’s got a problem. Any minute his wife Bonnie is going to come home, and she’s going to find a dead goon, a blood soaked car, and two blood covered hitmen doing gangster stuff in her house. And when she finds those two gangsters doing gangster stuff, Bonnie is going to divorce Jimmie on the spot. “I don’t want to get divorced,” Jimmie cries. Now chances are you’ve never been approached by two of your old friends to hide a body, but you’ve no doubt encountered potential situations that could easily turn into a Bonnie situation. And any number of these Bonnie situations could involve water damage and the desperate need for really fast water damage restoration. Your wife of five years declares that she needs a Saturday afternoon off. You, being a loving husband, tell her, go, go shop, go see that movie about the crying and the Notebook, heck, go take the entire weekend with your girlfriend. I got this. After all, you just have to take care of a four year old boy and a dog for a day. Not even a day. Twelve hours. How hard could that be? Not hard at all. You order a large pizza for you, the 4 year old and the dog (what? he likes it!) and settle in for a Saturday of college football. You get so wrapped up watching your old alma mater fight it out on the grid iron you kind of lose track of the four year old. He isn’t lost. You know he’s around, just not within your immediate sight… Probably because he has just wandered into the bathroom, opened the toilet, and has made the command decision that Mister Berry Bear needs to go potty. When you hear that toilet flush you know almost instinctively something has gone wrong. You try not to panic. You write it off as a strange occurrence. Maybe you have a ghost and the ghost just flushed the toilet. That sounds plausible. You go back to the football game for five minutes until your missing 4 year old walks into your living room, missing his favorite teddy bear and … covered in water? You turn off the TV and run upstairs to find a teddy bear lodged in your toilet and gallons of water flooding your master bathroom. You, sir, have yourself a Bonnie situation. Ask Yourself, What Would Fonzie Do? Be cool. That is the first rule of any Bonnie situation. Don’t panic and for the love of god don’t grab all your wife’s expensive towels and toss them on the floor in a vain attempt to clean them up. Bad move. First, shut off the water and stop the initial flooding. Then ask yourself, Hey, I got a Bonnie Situation and I was just reading a blog about what to do when I have a Bonnie Situation. It was a blog written for a water damage Westchester company… It will all come back to you. Then you will remember that this company is available 24/7 and responds within 45 minutes. They are sort of like The Wolf in Pulp Fiction. Our water damage Westchester company is here to bail you out of your worst water emergencies. We talk fast and we think fast. We can have your home restored faster than you can say Big Kahuna Burger. 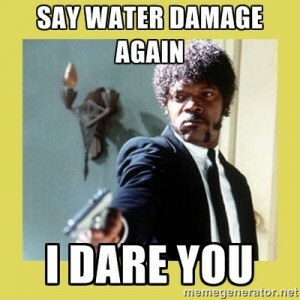 We’re not only experts at water removal, we are experts at helping you avoid life’s Bonnie situations. So chill out and send in the wolf.